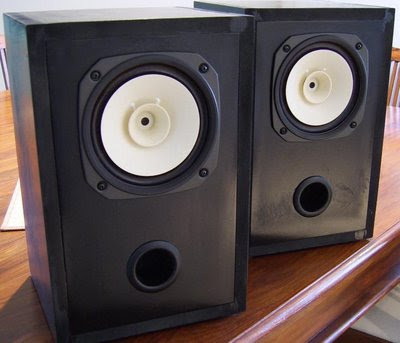 The very first pair of speakers I put together some thirty-eight years ago was a pair of single-driver loudspeakers using 8” Kaltro twin cone drivers. As I type this, I find myself once again listening to speakers using a single full-range driver. 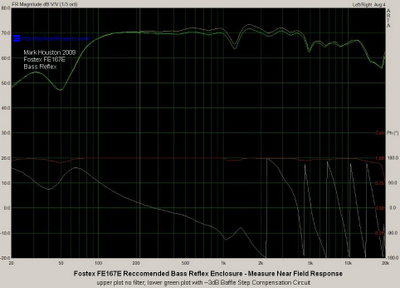 This time it is the 6.5” Fostex FE167E fullrange driver. I had recently completed a small low wattage 6T9 valve amplifier, and asked Gio for some suggestions on speakers to match the amp. He suggested the Fostex FE167E. When I saw they were 94dB efficient I ordered them instantly. Packaged with the drivers were two enclosure plans - a floor-standing unit as well as a bookshelf enclosure. I opted for the smaller bookshelf speaker box. 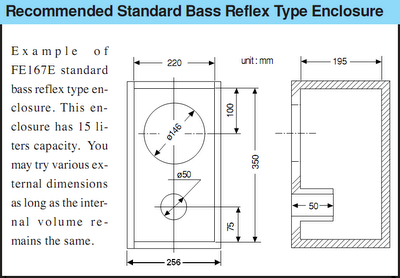 The Fostex Recommended Standard Bass Reflex Type Enclosure is 15L with a 50 by 50 mm port that can exit from the front or rear. The enclosure plan is shown below. 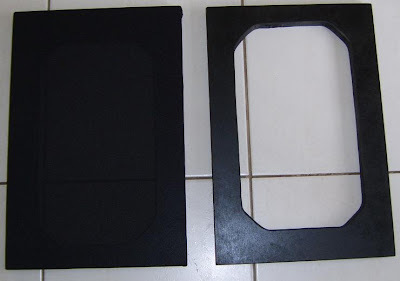 The speaker boxes were put together by a neighbor using 18 mm MDF. The boxes were clamped during the gluing process and the inside joints were sealed with additional glue. The back panel had heavy speaker sound absorbing vinyl glued over its surface and the box was lined with a single layer of thick Dacron (tontine). 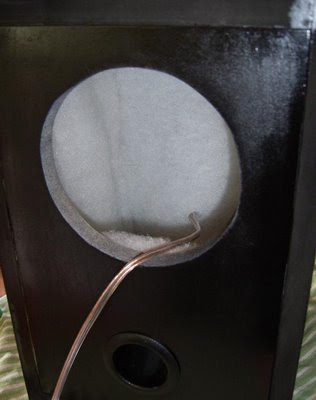 The binding post block was fitted and oxygen free copper speaker wire was used for the connections. Sealing sticky back foam was placed under the connecting block and also under the drivers which were screwed in place. The boxes were pre-sprayed with paint. Later grills were added by cutting the center out of a piece of MDF, stretching and stapling speaker cloth over the frames. The grills were attached to the speakers using Velcro. The baffle step correction / compensation (BSC) calculator can be used to determine a BSC specific to the width of your baffle. The amount of attenuation required will be subject to your listening room and amplifier as well as personal taste. Typically about 4 to 6 dB of attenuation is good. You can experiment with the component values shown below and select a BSC to suit your room, amplifier and personal preference. I am using L=1mH and R=2.7ohms. Out of the box the first thing you notice about the speaker drivers are the ultra-light the cones and very stiff suspension. The first few days of playing will see the drivers settle though expect to put in twenty to fifty hours before they settle completely. If you are not use to listening to single-driver loudspeakers you may be a little shocked at first. I was, but it doesn’t take long to recognize the all the good qualities of a single-driver speaker system. At a recent Melbourne Audio Club night held at my residence the Fostex FE167E speakers were auditioned with a small 6T9 tube amplifier and they received many accolades from the very discerning listeners. When compared with small 2-way bookshelf speakers the Fostex FE167E produced more bass and equal treble response. Most members could not choose one pair of speakers over the other. Voices however do appear forward on strong vocal tracks. This is not unpleasant just obvious. When teamed with the 6T9 tube amp, for which they were intended, they really come into their own. They are LOUD with only a few watts driving them, produce good bass and excellent mids and highs. The Fostex recommended enclosure design works well with the drivers and produces some excellent violin and cello gritty earthy notes in the instrument's resonance and character. Piano sounds soft, rounded and musical. Voices tend to come forward a little of the rest of the instruments as do some upper-middle frequencies. This adds some extra dimension to your listening. The plot below shows the measured near field response of the speaker system. The upper line on the plot is the measured response with no filters in place. The lower green line is the response with a baffle step compensation circuit of about 3dB. See the Fostex FE167E Fullrange Driver page for more information and enclosure ideas for this driver. what is the selling price for one these speakers...like the Fostex FE167E Full Range Driver??? ?